At IPS, we understand how difficult it can be to choose the correct light source in order to acquire the best image for your application, and that while there are many options to choose from, there is often only one solution for a lighting problem. Historically, fluorescent and quartz halogen(Fiber Optic) have been used most commonly. 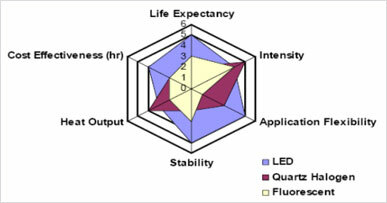 In recent year, LED technology had improved in stability, intensity, and cost -effectiveness. However, it is still not the cost-effective for large area lighting deployment, particularly compared with fluorescent sources. On the other hand, if the application flexibility, output stability, and longevity are important parameters, then LED light might be more appropriate. Can radiate uniform diffused light from a low angle. Particularly effective with round work. Varied radiation is possible depending on the use. Many types of lengths can be selected as standard illumination to match work. Width and length are changed with custom orders. 4 units for line illumination to match the use/ application. Adjustment to respective angles is possible. Corresponds to various applications. The new AOI light special designed for PCB board soldering inspection. A high-intensity type of diffused light illumination allow shadowless radiation in application. Even illumination transmits light at all angles allowing an object to be evenly illuminated. A backlight provides a field of even illumination against which the part is viewed as a silhouette. Next-generation LED light for line scan sensors that achieves unprecedented luminosity and uniformity. LED Spotlight are well suited for applications requiring a high degree of contrast on non-reflective objects.